I’m sitting down to write this post on my second day off since mid-August. And my first day off was yesterday, which I spent binging on TV and Super Nintendo … really needed that. I honestly can’t remember a more intense start to a year. Two tours, eight AFC concerts, our annual three-day retreat at Kneisel Hall in Blue Hill, ME, where we sketched out our Season 10, a three-day residency at DePauw University in Indiana where we discussed our experiences and AFC’s artistic and business models with the fantastic and engaged students there, two grant applications, one photo shoot, twenty-seven rehearsals, and probably the most bonkers program we’ve ever pulled off. That was “VS.,” one of two AFC shows on the Gardner’s Thursday night Stir series this season (the other will be the awesome and powerful “Lady Russia” on March 3rd, featuring music by Sofia Gubaidulina and Olga Bell). “VS.” was a program I drew up and the group picked out a year ago, featuring music relating to conflict in sports, war, and politics, hopping back and forth between the baroque and the 20th century. Sport went from Queen to John Zorn to Rameau, War was a WWII radio drama, Samuel Scheidt, Shostakovich, and Takemitsu, and Politics went from The Song of the Birds through Vivaldi to Frederic Rzewski’s epic Coming Together. It all made sense in my head… at some point. In my introductory comments to the audience, I referred to our Stir concerts as AFC’s Test Kitchen, a forum where we have the freedom to take risks and delve into high concept programs, the avant garde, jazz, dance, or whatever strikes our imagination. And I made that comparison mere seconds before the first note, truly without the slightest clue how the evening was going to go, only the thought: “this could work.” A couple days out I’m still not quite sure what happened. What it confirmed though is really the same thing that all of our shows do, only to an especially pronounced degree here: that this group is populated and surrounded by people with some serious superpowers. I’m looking at you Alicia Mielke, coordinator of the concerts at the Gardner, who handled innumerable special requests, printing out newly edited parts up to 15 minutes before show time, all the while graciously welcoming patrons as if nothing was amiss. Or Bradford Gleim, kickass baritone, here our narrator, who brought exceptional dedication, focus and intensity to the Rzewski, far exceeding anything I could have imagined. Or Karl Doty, who took it upon himself to dust off his electric bass and learn the Rzewski’s harrowingly difficult part for that instrument, a full 22 pages of constant 16th notes. If only there were military-style decorations for musicians, I think they’d be bestowed to each and every person involved in making this show happen. And at this point it really does feel like we made it through some kind of a crazy ordeal, that’s left us all unsure whether to think “let’s do that again!” or “let’s never do that again!” After some well-earned rest, though, I think I know which we’ll choose. In the last couple of years, the city’s classical music scene has been receiving shots of adrenaline from what might appear to be unlikely sources: two scrappy chamber orchestras newly founded and staffed by prodigiously talented conservatory students and recent graduates. The groups - A Far Cry and Discovery Ensemble - are structured differently (the former plays without a conductor, the latter is led by the young and charismatic Courtney Lewis), but both convey a passionate musical commitment, a high level of technical execution, and, perhaps most strikingly for audience members accustomed to the sober professionalism of more established groups, an intense joie de vivre derived from the thrill of making music together. We're honored by the comparison, and applaud the Discovery Ensemble's every success. More music for all! The most terrifying things are those that appear familiar on the outside, but are alien within. For centuries societies blamed strange events or intermittent loss of sanity on the phases of the moon (luna). Lunatics, they called these victims. What was particularly disturbing about the idea of lunatics was their instability, or rather, their changeability. Trapped behind a familiar face was something all together alien that bent and disarmed the mind uncomfortably. On the program today are a series of pieces that that employ standard musical forms that are permutated through a lunatic lens. Like a fun house of mirrors, what you see is not always what you will get. Perception is not reality, or vice versa. Did you know Battle Music was a legitimate genre? From the 16th century all the way into the 18th it was the rage. During the Baroque in particular, the music was not meant to describe specific battles or events, but was used more for “dramatic or allegorical purposes.” Charles Burney (1726-1814), the intrepid music historian, said of Heinrich Ignaz Franz von Biber (1644-1704): “of all the violin players of the last century Biber seems to have been the best, and his solos are the most difficult and most fanciful of any music I have seen of the same period.” Fanciful elements included his use of scordatura (mistuning), and compositions that included replications of the sounds of birdcalls and bells. Biber’s Battalia à 10 was written in 1673. Keep that in mind, especially when you hear the second movement, Die liederliche Gesellschaft von allerley Humor (“The dissolute society of all sorts”), where each instrument is playing a different tune in different keys and time signatures to portray drunken soldiers. And you thought Charles Ives (1874-1954) was original. Biber also applied Claudio Monteverdi’s (1567-1643) Stile Concitato (“agitated style”), in which notes were rapidly repeated or trilled to evoke agitation. Watch for other effects throughout, such as the snapping of strings to imitate gunfire. This “Lunatic” program could be subtitled “Haunted by the Ghost of Arcangelo Corelli.” He was a Baroque era composer of “unparalleled influence,” over which it seems no one had a drop of anxiety. He appears a couple of times on this program, and in the Concerto Grosso No. 3 in C major of Francesco Saverio Geminiani (1687-1762), he is directly involved. Geminiani, not only a composer, but a renowned violinist, based this work on Corelli’s Violin Sonata Op. 5, No. 3. “Il Furibondo” (“the madman”) was Geminiani’s nickname bestowed upon him because of the expressivity of his compositional rhythms. Expressiveness equates madness? Now, I know you probably don’t equate the Baroque with emotional abandon, but back in the day, the Baroque was intense. It was the era that blossomed from the seconda pratica (“second practice”), the era of free dissonances, of music being liberated from primarily serving the text in a supporting role to taking center stage for the portrayal and evoking of abstract emotions. As the Concerto Grosso No. 3 is based directly from Corelli’s Op. 5, No. 3, it is structured as a sonata di chiesa (“church sonata,” as opposed to a sonata da camera, or “chamber sonata”). Thus, it is constructed of four movements, alternating in tempo as slow-fast-slow-fast. The rhythmic and melodically dissonant rubs in this piece are delicious, like drops of honey on your fingers, sticky but sweet. If this constitutes madness, let’s all hope for a full moon. “concerto GROSSO can be seen in two ways: it is either a chamber piece for 18 strings, or a concerto for an 18 string orchestra where all players are soloists. In either case, it is 18 minutes long. Attempting to blur the line between chamber and orchestral music at this scale creates a grossness in the music: multiple overlapping layers, thick dissonant chords, a sense of rhythmic disorder and chaos, not to mention the physical challenge of holding the piece together. To balance this complexity the overall structure is simple: 3 movements with familiar forms: solo vs. tutti, fugue, and passacaglia/theme & variations. In one sense the forms are sterile and mathematical, while the music remains terribly personal as well. The titles of the movements are literary (to a degree). Their sources will remain hidden for now (though a simple google search will reveal much), but their preoccupation is clear: death. These notes will not dwell on the personal motivations and emotions behind them: too detailed a revelation would hinder, not help, the appreciation of the music. concerto GROSSO is dedicated to the memory of a beloved aunt. The audience is invited to contemplate the movements as they are tonight, and perform further investigation if they wish. The first movement is built on alterations between large tutti and small solo groups. The line between solo and tutti is intentionally vague. The urgent 16th notes of the theme are framed by full orchestral chords at the beginning, middle and end of the movement. As the final sounds fade, a familiar strain may be heard floating from the violas. An 18-voice triple fugue is quite disgusting to behold. Is it as disgusting as the undead, or the obsession with death? Alfred Schnittke (1934-1998) suffered from a case of classic USSR creative claustrophobia. The soil beneath his feet was his homeland, familiar, and yet those who ruled upon it made it him a stranger in his own land. It has been noted Schnittke’s music inherits the Shostakovich tradition of “alienation expressed through irony.” Schnittke touted a musical style he coined Polystylism, which wove together musical traditions of the past through the lens of a modern eye using quotation, allusion, and adaptation. The Concerto Grosso No. 1 is adapted from the Baroque concerto grosso (“big concert”), a form in which a small group of soloists (concertino) is pitted against the larger ensemble (ripieno). Arcangelo Corelli was a cornerstone composer of these works. He also codified the genre. Taking a look at the stage you might be fooled into thinking you are, in fact, at a Baroque concert, harpsichord and all. However, the familiar quickly becomes the lunatic stranger once the prepared piano emits its ghostly tintinnabular sounds – yet we know not for whom the bell tolls. We discover the genre has been delightfully, yet disturbingly, corrupted. Listen for sudden insertions of Baroque idioms, slitheringly abrasive rapid violin lines that hint at George Crumb’s Black Angels, “Corelli Clash” dissonances between the two violin soloists that seem to have suffered from lead poisoning, and a disarming visit from Tango master Astor Piazzolla (or someone like him). Oh, and be prepared to take a moment to process what you just heard before you applaud. Like a Kafka novel, this music is a self-contained world from which you might need to reacclimatize. 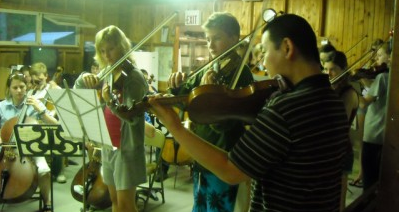 I visited one of my dear friends, violinist Julia Cash at Point Counterpoint music camp on the shores of Lake Dunmore, Vermont last week, where she is in her second summer of performing & teaching teenage musicians. A gorgeous spot on the Lake right at the foothills of the Green Mountains, the camp reminded me of a few summer camps I'd been a part of in my youth, with the bunkbeds, the practice cabins & right down to the family style communal dining. Part of the reason I was passing through also was to give a chamber orchestra workshop for the campers here who spend these summer weeks learning chamber music & taking lessons, and I showed up armed with my laptop, a projector and parts to Mozart's Divertimentos & the Holberg Suite by Edvard Grieg. I've been doing these sort of Power-point type presentations for a couple of different organizations starting this past fall, not only talking about A Far Cry and showing on & off-line examples of how we operate and manage, but showing our performance videos as a built in component to these workshops. (I mean, I spend enough hours editing and syncing these videos with high quality audio, I always end up wanting to show them to the public, especially to those who've never seen or heard of us..) I think most of the kids at PCP really enjoyed the presentation. Quite frankly I was a little daunted having to lead a performance portion after the talk for these 50 or so youngsters, as more than half of them were sight reading the pieces I had brought with me. However to my surprise, they did so well!! A lot of them were able to follow the more complicated directions of dynamics & phrasings of these pieces by the 2nd and 3rd reading as I was thoroughly impressed. I spent my free time during these couple of days kayaking & swimming around Lake Dunmore & making new friends with the faculty and staff at PCP. It's nice to inspire young and raw talent, as I remember when I was at their stage, how much I was ready to soak in the great music & experiences that would come my way. And I have to say that I'm gladly and consistently surprised that so many kids I encounter are not only interested in classical music but have a genuine appreciation for it...It really is exciting to see. At our concerts, we definitely see a few more youngsters than some of the other venues around town, but still the majority of our loyal fans are the mature audiences. So I'm even more excited to have met these kids and plant the seed. I hope they tell all their friends, their siblings, cousins and their teachers at school and will come see one of our Jordan Hall concerts this next season. Kathryn Bacasmot authored these highly entertaining and thought-provoking program notes. Enjoy! I know, I know. You’re looking at this and thinking, “these are the program notes? Where is the anecdotal story followed by interesting historical factoids, dates, and a roadmap to the music itself?” Don’t flip the page over. This is it. Welcome to A Far Cry program notes. Let’s talk “Legacy.” If you type the word “Legacy” into the search box on dictionary.com, the fifth definition reads: “of or pertaining to old or outdated computer hardware, software, or data that, while still functional, does not work well with up-to-date systems.” Is it heresy for me, a musicologist, to say I think of “classical” music when I read that description? Musicians inherit a legacy and are handed down history. Now would cease to be now if then or when did not exist. Without composers and performers it is a merely a series of archaic symbols, a cacophony of dots and lines, data that, while still functional, might be dead on a parchment pyre. Musical history is a delicate fabric of encounters easily unraveled. Warp & Weft. Teacher & student. Composer & performer(s). Choreographer & music. The meetings of minds, and in those meetings the inheritance is remixed and renewed. Data, still functional, in a karmic cycle of rebirth. Isn’t it fascinating that so much invisible beauty is manufactured through such physical labor? The hand of a composer grips a pen that hovers over paper in anticipation of what will come next, or clicks the mouse on composition software. The body of the performer aches through hours of rehearsal, holding, caressing, cajoling, thrilling in exultation or trembling in defeat. Instruments are built and repaired, morph and stay the same, according to the sounds of the times and the materials and technologies available. Music is hardly a dead language. It’s alive in the physicality. Each person you see or hear on stage today is a part of the inheritance. Their fingers are fluent and fluid espousing old and new dialects of the language of sound. You, the audience, play an equally vital role. Your ears and minds are the stereos. If a tree falls in a forest, if a sound wave shoots through an empty hall, does anyone care? Wolfgang Amadeus Mozart (1756-1791) had quite an ear attached to the side of his head. Legend (who occasionally goes by the name Dr. Charles Burney) tells us the young Mozart was responsible for writing down, and therefore preserving the legacy of, the famous Miserere by Gregorio Allegri (1582-1652), which was traditionally handed down only orally. Mozart was a bridge to the past and an agent for the future. His piano concertos are among the roots of the genre. Today we hear pianist Markus Schirmer put his interpretational brick down on the road that Mozart laid in Vienna, 1782. Felix Mendelssohn (1809-1847). Talk about legacy. His aunt Sara Levy studied with W.F. Bach and was a patron of C.P.E. Bach (yes, sons of J.S. Bach). Additionally, one of Felix’s claims to fame was his 1829 “revival” of J.S. Bach’s St. Matthew Passion. With that ascension to the podium he effectively launched the widespread fame of Bach and an appreciation for regular performances of pieces by long dead composers (more of an oddity on a program in prior days when the new was all the rage). Today’s performance of Mendelssohn’s Sinfonia No. 8 in D major composed in 1822 features the next generation of musicians with New England Conservatory Preparatory students Andrew Dezmelyk and Meredith Treaster. Igor Stravinsky (1882-1971). Well, he started with a “neo-classical” phase and then jutted off to a springtime rebirth of the old into a new dialect, didn’t he? His Concerto for Strings in D major from 1946 leads something of a double life. Today you hear it in its usual concert setting, but it moonlights as accompaniment to a dance. Choreographer Jerome Robbins (1918-1998) heard it and thought about female insects preying on their male counterparts and called it “The Cage.” Rather Kafkian. King of the Castle? Try Queen. The “Rite of Spring” was a passage of a different kind - the kind that dared to go places that induced public fist fights (maybe Plato was on to something with that concern about music stirring up hot headedness after all?). Dissemble the data and it still functions. If you break the mirror and put it back together it reflects and refracts in an entirely new way. Today you will hear something you have never heard before in your whole life. That’s something you can’t claim every Thursday of the week (well, unless you want to go all John Cage on me, but let’s not digress). Reiko Yamada’s New Shadows in the Raw Light of Darkness was inspired by and written for A Far Cry upon repeatedly listening to the ensemble awaken a new soul in old pieces. Like Georgia O’Keefe before her, Yamada was inspired by the stark landscape of the South West – Taos, New Mexico in Yamada’s case – during her 5-week residency at the Helene Wurlitzer Foundation. Out there the lines of the earth stretch and clash with the lines of the landscape, both natural and manmade. A collection of lines. A collection of individuals and friends. A collection of musicians weaving and sewing together the lines of music, the threads of sound. A fabric paying homage to the past, building upon the legacy, attaching new rungs on the ladder to the future and casting new shadows in the climb. Data. Functional. Legacy is now and legacy is you. Kathryn J Allwine Bacasmot a pianist/harpsichordist/musicologist and freelance writer. She received her Masters in Musicology at the New England Conservatory of Music with her thesis on Björk Guðmundsdóttir and aspects of the female experience in her fifth studio album, Medúlla. In addition she works for From the Top, a weekly radio and 8-time Daytime Emmy Award nominated television show featuring the nations most talented young classical musicians distributed on NPR and PBS. Wow - what an incredible trip to the Florida Keys! The audiences were amazing, the hospitality was out-of-this-world, and our rental Priuses only used $20 of gas to go 500 miles. What a tour. Here are a few photos, mostly from a couple of educational concerts from Tuesday morning: Courtenay, Frank, Annie, and I played and spoke about music at the Marathon Middle/High School as well as the Elementary School, for a total of nearly 1,000 kids! Many thanks to Cindy Stong for coordinating the two educational concerts and to Edward Bouton (my grandfather!) for taking these great pictures. Click on the photo below to see the collection! A Far Cry arrived in the Florida Keys today, and this is my first time here. The beauty everywhere took me by surprise, and being so completely surrounded by water (even the humidity in the air) makes me feel like a completely new person. I think that I can expand and be more fully myself when I feel all of the water molecules from the air seeping into my winter-in-Boston-dried-up body. (I'm an Oregon duck, so this is how I'm meant to be operating!) Jesse's grandparents, Ed and Betsy Bouton, hosted us for dinner, and there was even a fireworks display further up north that we could see from their dock. Kate, our guest Crier on bass, and I are housemates, and our hosts and their house are the epitome of graciousness. In fact, I am now going to go for a little swim before retiring. I'm sure it will help our concert tomorrow sound very refreshed and fluid. Can't wait! Years ago, I'm sitting in a car with a group of people, headingsomewhere - a music festival? A bassist is driving the car, I think. We are having a great time listening to Bela Fleck when the driver decides that it is time to turn things up a notch. "Listen to this," he says, puts in a Kronos Quartet CD, and punches a track number. Fistfuls of notes start bouncing around the car at lightning speed, followed by one of the most stunningly "alive" melodies I've encountered. Paired with an amazing groove in the rhythm section, which must have included one certifiably insane dulcimer player, this song takes off like nothing I'd ever heard. I love to exaggerate, but that statement is 100 percent bona fide - and the energy created by this CD track is wild, whirling, and totally wonderful. Perhaps that's why I neglect to catch its name at the time. Fast-forward a good bit and suddenly it's 2008 and one of the other Criers is mentioning to me that there's this great tune out there that Jesse got to know during a Silk Road workshop at Carnegie. The thought is to ask someone named - who was it? - Zhurbin - if he'd be willing to make us an arrangement. "Wait a second," I say - "Lev Zhurbin? You mean, Ljova?" And suddenly, things are rewinding again, back to my first moments in the now-long-silent Wild Ginger Philharmonic, playing in a viola section led by a guy named Lev who seems too have much energy for any single musical phrase, who seems to want to play them all at once... followed by stints out in front of New York restaurants with my new friend, improv-ing fiddle-style on two violas... and moments like the one in that Village place where the performer we had come to hear was late - so Ljova borrowed my viola, strolled on stage, and proceeded to steal the show by improvising out of thin air until the other musicians arrived... followed by my then-bemusement as this inspiring musician busted out of Juilliard and the status quo, left it all behind, and started doing things his own way for good. I'd tell Lev about rehearsing Brahms, or maybe it was Bruckner or Bartok. How great it was. "Well..." he'd say, "today I wrote a Mexican tune and I think it sounds kinda Mexican." Anyone who wants to know how this particular story ends only has to glance at Ljova's website, www.ljova.com. So (the present interjects) before I know it, I'm emailing my old friend to ask about the possibility of arranging this unknown tune with a weird name. I'm happy to be doing it. Even though I have no idea about this music, I trust all the players in this situation absolutely. Jesse wouldn't be excited about this piece unless it was going to rock the proverbial house, and Ljova wouldn't take something like this on without making it shine. It's 11:30 PM (or is it 12:30? ), mid-December, and Lev and his wife Inna (amazing singer-by-night, lawyer-by-day... whew!) and I are at a friend's house in Boston. We're listening to a reedy MIDI playthrough of the Silk Road arrangement of this piece and watching the score pages autoscroll by. Somehow, the pipa line needs to get shared out between the string sections, he says. My tired head nods. "But I can't do it right now - the Latin Grammys are coming up in days." Well, the Latin Grammys came and went, and one fine day, a gorgeous stack of PDFs of "Turceasca" landed in my inbox. Curiously, it was just a couple days before that that the Great Revelation had finally struck me. Lev had mentioned that he needed to run the parts by Osvaldo Golijov, because the original arrangement had been the one that Golijov had made for the Kronos Quartet. That moment of wondering "could it be the same piece?" followed by the wonderful shock of recognition left me immensely eager to finally get out there are discover what this nifty, nutty, tune was REALLY all about. So, I finally started doing my homework! Check this out. Also potentially of interest is this link to a great little folk dancing sheet that details precisely what kind of a dance the "turceasca" is - "arms free and active, mostly in front of the body, hands at shoulder level, elbows slightly bent - steps generally small - usually the hips sway with each step touch..."
In a way, I wish my dear friend Lev Zhurbin was up here to hear the fruits of his labors, not just because it would be great to play Turcaesca for him, but because he could be the one to get people up out of their seats and show them how to enjoy themselves in motion. As proof, I offer you one of the sweetest videos I've ever seen - his wedding procession/dance through the streets of New York City. Old world, New World, different souls, same spirit. There's so much to write about this piece, and the weird confluence of different situations and relationships that helped to generate tonight's performance. In a way, it's a metaphor for what we're navigating in the entire program! But I'll let you go now, with one final wacky thought. When Ljova first sent up the PDFs, he sent a MIDI file of the new arrangement with them. Of course, the sound is horrible and there's no sense of rubato, no energy, no nuthin.' All the same, I've gotten strangely addicted to it. It's great to hear the Taraf de Haiidouks and their effortless virtuosity. It's great to hear the Kronos Quartet sweating away. But there's something weirdly wonderful about listening to this silly midi file, because it leaves all the doors wide open. No decisions have been made, no opinions stamped. Everything is still possible. In its squat package of sound, I feel like I can hear what may happen tonight, what may happen on Sunday, and what may happen at any point in the future.